Holding up a plastic bottle of store-bought ranch dressing, Scott McCandless does what many consumers fail to do. As he lists ingredients in the order they appear – vegetable oil, water, egg yolk, sugar, salt, cultured nonfat buttermilk, natural flavors – listeners’ faces begin to fall. Phosporic acid, xanthum gum, modified food starch, monsodium glutamate, articificial flavors, disodium phosphate, sorbic acid, disodium inosinate, disodium guanylate. McCandless stumbles over the pronunciation of some of these additives, used as flavor enhancers and preservatives. But he doesn’t mince words when he admonishes his guests. McCandless – owner of Spokane’s Clover restaurant as well as nearly 40 Subway and Papa Murphy’s franchises – wants people to make their own at home. McCandless considers it his personal mission to change the way people eat as, he likes to say, “one plate at a time.” To that end, he created and continues to teach a Salad Dressing 101 class along with Soup 101 and another workshop on barbecue sauces, brines and rubs. He generally holds one of each per season, or three or four of each per year. Salad Dressing 101 is most popular. It regularly sells out. This time of year, so does the soup class. The Oct. 26 session is already sold out, but there’s room in the Nov. 2 offering, which runs from 6 to 8 p.m. at the company headquarters: Conversion Concepts, 608 N. Argonne Road in Spokane Valley. McCandless – who also owns Spokane’s Edible Arrangements and the new Bellacrosta Bakery and Fine Foods commercial baking operation in Spokane Valley and storefront in Liberty Lake – held his first salad dressing class four years ago. He added the barbecue workshop a year later and started soups in 2015. During the salad dressing class, McCandless demonstrates five recipes. He starts with a Greek yogurt-tarragon dressing and continues to blueberry vinaigrette. Each includes a tasting. “You get that (blueberry vinaigrette) on some king salmon and bellissimo!” McCandless told his most recent class, held mid-September at the new Bellacrosta cafe in Liberty Lake. The $40 tuition includes snacks: Bellacrosta bread, extra-virgin olive oil (regular and basil-infused), pepper-cheese spread. Participants get to take home a salad dressing of their choice as well as a small bottle of the olive oil brand McCandless sells at the café and uses exclusively in the salad dressings at Clover. To prove this point, he serves what he calls “the ultimate dessert,” or a scoop of vanilla ice cream drizzled with balsamic vinegar – not just any balsamic vinegar, but balsamic vinegar that’s been aged 30 years. He also serves that pepper-cheese spread, made in-house with one of his favorite Pacific Northwest products: Mama Lil’s Mildly Spicy Peppers in Oil. His class includes a side-by-side comparison of commonly used olive oil, red-wine vinegar and pepper next to the brands McCandless prefers. When it comes to olive oil, McCandless opts for Sciabica from California. Participants also get to sample of Clover’s candied pecans, which typically top salads at the restaurant. They’re boiled in simple syrup with a kiss of cayenne, then deep-fried and coated with cinnamon-sugar and a little more cayenne. “We refer to them at the office as crack,” McCandless said. He grew up in Gilroy, California, the self-proclaimed garlic capital of the world. “We used to joke that when we bought a steak we didn’t need to marinate; we just needed to hang it out the window on the ride home,” McCandless said. Today, he loves to use garlic, shallots and fruit to flavor his dressings. The blueberries in his vinaigrette recipe can be switched out for other ingredients: raspberries, cherries, watermelon, pear. The method is the same: boil down the fruit or berries, then strain and further reduce. To brighten it up, he adds citrus. To sweeten it up, he uses carrots. McCandless answers with a personal anecdote. In 2000, before switching to scratch-made dressings, sauces and soups, he said his “bad” cholesterol measured 210 milligrams per deciliter, way past the 100 to 129 milligrams recommended by Mayo Clinic. Today, he said, it’s 132. It is more healthful to make dressings – and sauces and soups – from scratch, agreed registered dietician Terry Perry, the new director of kitchen programs of Second Harvest in Spokane and a board member of the Greater Spokane Dietetic Association. 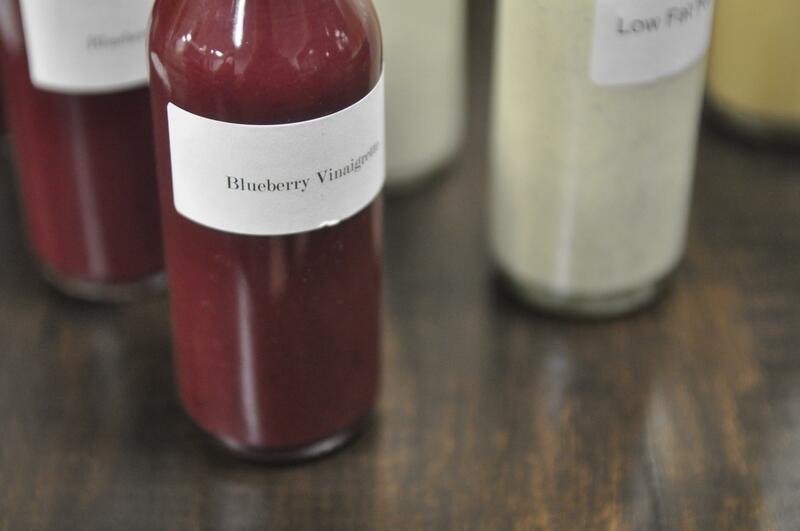 Small-batch dressings generally don’t require preservatives, Perry said. If he’s whipping up a salad at home to pair with steak, McCandless said he would combine button mushrooms, endive, radicchio, romaine and cheddar, then dress the mixture with a red-wine vinaigrette. “Here’s what I do: the sweeter the dressing, the more bitter the lettuces,” he said. He’s also a fan of San Marzano tomatoes, fennel, jicama, daikon radish, roasted corn on the cob and Parmigiano-Reggiano – “none of that stuff in the green can,” which he tells salad dressing students to toss out. Classes last about two hours. After a short break midway through, it’s time for more advanced dressings: Caesar and blue cheese. Caesar was Lyn Edwards’ favorite. And, “Once I got home, I was able to recreate salad dressings from the class,” she said. Near the end, participants spoon samples right from the bowl of the blender. “Much better than the bottle,” said another. Combine all ingredients through pepper in the bowl of a food processor or blender, and process. While mixture mixture is processing, slowly drizzle in olive oil. Combine all ingredients in the bowl of a food processor or blender, and process until combined. Published: Oct. 13, 2016, 4 p.m.